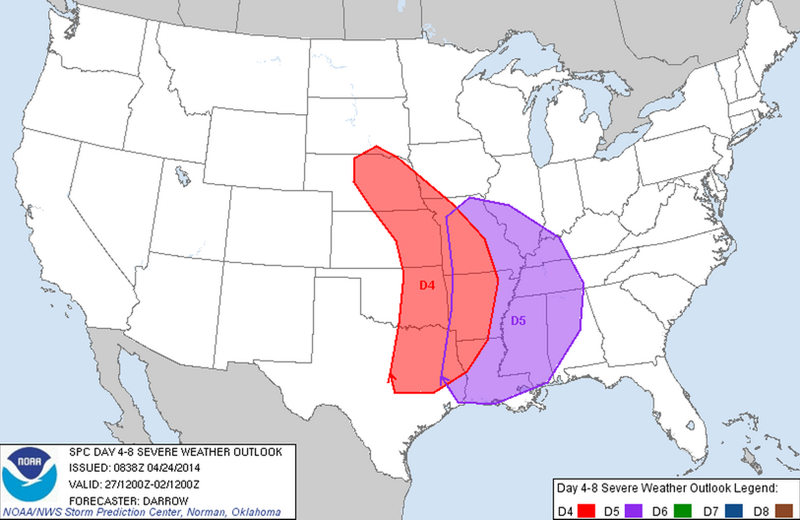 Rude Awakening to Severe Weather Season? This tornado season is off to a record slow start, but an active severe weather pattern is setting up for this weekend. The storm that we've been tracking for the coming weekend which, depending on the eventual track, should bring a return to cooler and wetter weather here on the front range, will also bring an outbreak of severe weather across the central and southern plains. Saturday afternoon looks to bring the first round of severe weather, including large hail, high winds and isolated tornadoes. The threat will extend along the dryline from Texas clear through to Nebraska, where dew points could climb into the 60s by late afternoon, and at least briefly enhance tornado threat. At this time, it appears that Colorado won't be able to advect enough low level moisture back into the state to get in on the action on Saturday afternoon except maybe across the eastern border out into Kansas. 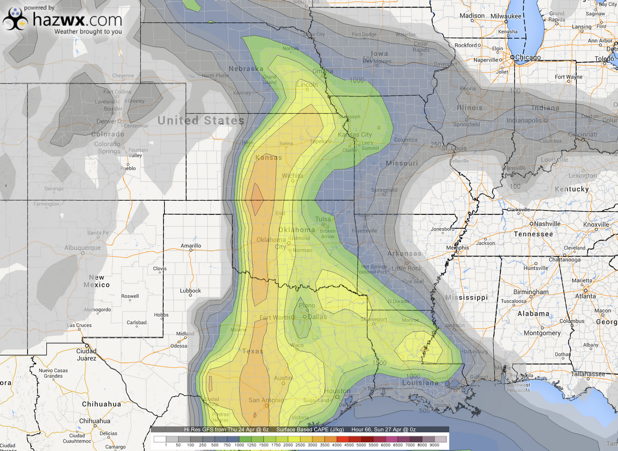 The dry line (intersection of moist air and dry air) will shift out into Kansas and become the focus for discrete supercells that will have the potential for large hail and a brief tornado. 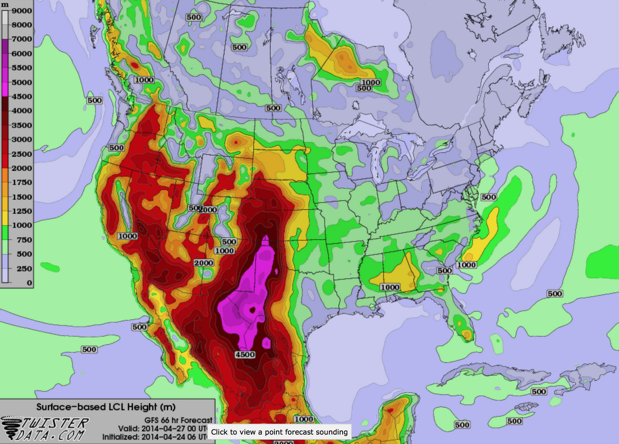 On Sunday, more ingredients come together to bring us the potential to see an outbreak of strong tornadoes across central Kansas, Oklahoma, Texas and points eastward. 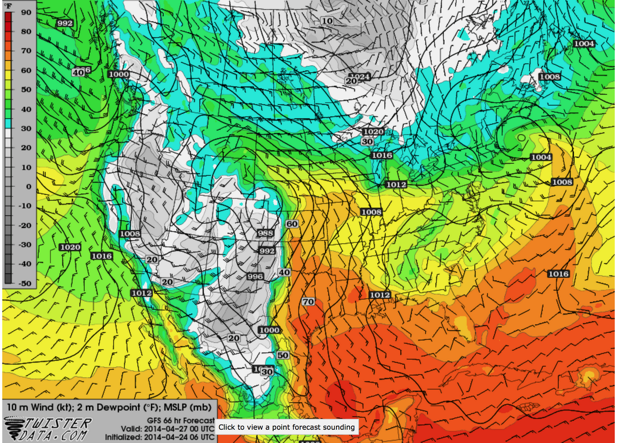 Surface based CAPE across Kansas, parts of Nebraska and Texas is nearly 3500j/kg! That, combined with dew points near 60-65 degrees will provide the fuel for severe storms to fire along that above mentioned dryline and then moving E/NE. Each day the threat should shift a bit further east, eventually encompassing parts of the southeast. Keep your weather radios handy and be weather aware Saturday afternoon through Monday afternoon as this widespread event unfolds. On the back side of this system comes our chance for rain and snow in Colorado. We'll have an update shortly on where things stand there -- still plenty of wobbling in eventual storm track -- and continue to monitor what promises to be a very active few days of weather across the United States this weekend.